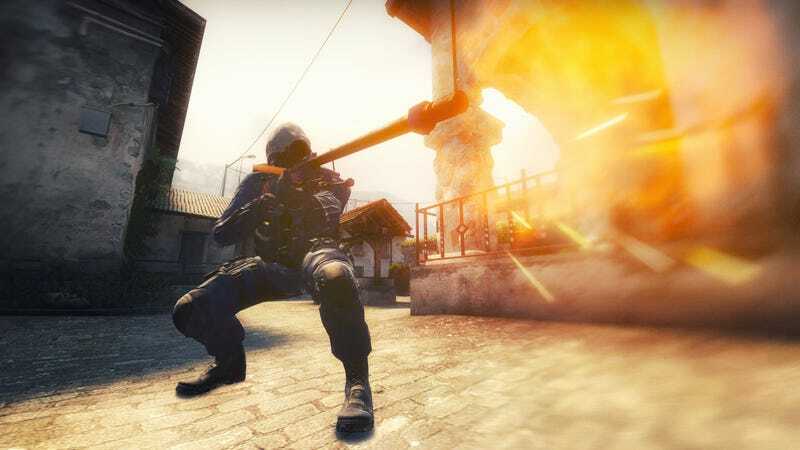 Over the holiday weekend, a whole load of dirt got thrown into the already murky waters of the Counter-Strike: Global Offensive gambling scene. Popular YouTubers Trevor ‘TmarTn’ Martin and Tom ‘ProSyndicate’ Cassell were revealed to be key staff of a skin gambling site they’ve promoted (sans overt disclosure of that fact) on multiple occasions. CSGO Lotto is a site where you can gamble real money in hopes of winning Counter-Strike weapon skins, the rarest of which are worth hundreds and even thousands of dollars in real world cash. If you pay a few dollars, you watch a roulette-style apparatus select who wins an item. Sites like CSGO Lotto stand to rake in a handsome sum off these transactions. A Bloomberg report from earlier this year pegged the Counter-Strike gambling scene’s value (in 2015 alone) at $2.3 billion. The controversy surrounding Martin, Cassell, and CSGO Lotto began when HonorTheCall posted a video in which they dug into major CSGO gambling site CSGO Lotto’s incorporation details and discovered some pretty stunning information: the site’s president is Trevor Martin, and its VP is Thomas Cassell. Despite this, Martin has posted videos like “HOW TO WIN $13,000 IN 5 MINUTES” about CSGO Lotto, while Cassell has done things like taking a $50 sum and using it to rack up hundreds of dollars on the site. In short, h3h3 was unable to find any instances of Martin or Cassell disclosing affiliation with CSGO Lotto—let alone high level operation of it. Responding to this in a video that’s since been made private, Martin claimed that, “This is something that has never been a secret.” Cassell, meanwhile, claimed (via Twitter) that, “I’ve always disclosed that my CSGO videos were sponsored & even asked a YouTube employee if anything more was needed & they said it wasn’t.” He also apologized to anyone who felt they were misled. That’s some... interesting wording, especially coming from a guy who previously found himself in hot water after failing to disclose financial ties to Dead Realm, a multiplayer horror game he promoted on his YouTube channel. On top of that, in an earlier video about CSGO Lotto that’s since been made private (you can see it in h3h3's video above, however), Martin said things like, “We found this new site called CSGO Lotto, so I’ll link it down in the description if you guys want to check it out. We were betting on it today and I won a pot of like $69 or something like that, so it was a pretty small pot, but it was like the coolest feeling ever. I ended up following them [CSGO Lotto] on Twitter and stuff, and they hit me up and they’re talking to me about potentially doing like a skin sponsorship.” That is, as PC Gamer points out, a pretty strange way to talk about a site you helped found. Martin has also claimed that CSGO Lotto videos did include disclosures, but if you run videos like “HOW TO WIN $13,000" through the ol’ Wayback Machine, it appears that a very slight disclosure—“video made possible by CSGO Lotto”—was added after the fact. Other videos, meanwhile, either lack the disclosure or have been made private. Martin has also claimed that he wasn’t in charge of CSGO Lotto when that first video was posted, that it was a “feeler” to see if partnering with the gambling site would be a worthwhile business venture. Again, however, the incorporation paperwork suggests otherwise. Promoting a site like this sans disclosure is, of course, illegal, per rules laid out by the Federal Trade Commission last year. It’s also tough to look at a situation like this without wondering if Martin and Cassell were being entirely honest about their earnings on CSGO Lotto. If they control it, after all, flubbing the numbers isn’t outside the realm of possibility. I should stress, however, that I am merely speculating on widely held sentiment. It has not been proven that Martin or Cassell did anything to that effect. That said, a YouTuber named PsiSyndicate (no relation to ProSyndicate) has since claimed that a different CSGO gambling site rigged their system so he could win big and post a video promoting his earnings. So, if you buy his account of events, it is a thing that can happen in CSGO’s bandit-friendly Wild West of a gambling scene. I reached out to both Martin and Cassell for comment. While the latter has yet to respond, the former said, “We are not making any statements at this point in time.” However, they are hoping to have something ready later today. Until then, this is decidedly not a good look for a reportedly multi-billion dollar scene that’s already facing scrutiny due to a pending lawsuit against Valve over the legality of facilitating what essentially amounts to unregulated gambling. Regulation, you’d hope, would stop something like Martin and Cassell’s shady dealings from occurring. Or at least, it’d discourage people from attempting to game the system. The bottom line: Valve needs to drop the hands-off approach and grab ahold of this thing asap. The Counter-Strike gambling scene might be helping funnel millions into Valve’s pockets, but they can no longer afford to stay silent about it. Update 7/6/16: Martin has issued an apology video in which he seems decidedly not very sorry. He once again claimed his connection to CSGO Lotto has been “a matter of public record” since the company first came into existence. Weird, seeing as he previously claimed one of his videos was a “feeler” to see if he should partner with the site. In that video, he sure made it seem like he’d never heard of it before. He went on to then do the actual, you know, apologizing. Kinda. “I owe you guys an apology,” he said. “I am sorry to each and every one of you who felt like that was not made clear enough to you.” So yeah, sorry you felt that way! A real stand-up moment of responsibility and penance, there. What a guy. He added, “I am committed to making sure my YouTube channel and all of my other businesses are in compliance with the law.” At this time, however, many of his CSGO Lotto videos are still set to private, and his next steps are unclear.